Figs are one of the ‘seven species or שבעת המינים’ that are noted in the Hebrew Bible as being one of the special agricultural fruits of Israel. The fig tree is also mentioned after the Tree of Life and the Tree of the Knowledge of Good and Evil, as Adam and Eve, used the leaves from the Fig Tree to make garments for themselves to hide their naked bodies in Genesis. Native to the Middle East, fig trees are grown all over Israel, thriving in the temperate climate. Figs grow on the Ficus tree also known as ficus carica, a member of the Mulberry family, but are unique in that they have an opening, called the "ostiole" which are not directly connected to the tree, so help the development of the figs by heightening its communication with the environment around it. There are many types of figs grown in the region with many varieties exported by Avniv, Israel's largest exporter of figs. The sweet, delicate fig is full of vitamins, minerals and natural dietary fibre and are eaten both fresh, picked from a tree and dried. There are many ways of using both fresh and dried figs in cooking and baking, to compliment their sweet, intense flavour. Figs particularly partner well will honey, nuts, warm spices such as cinnamon and cardamom, fresh herbs, thyme, za'atar or rosemary and cheese, especially blue cheeses and soft goats cheese. 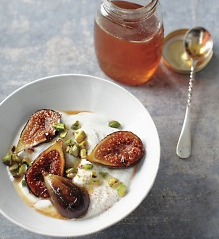 Figs are very high in natural sugar, so fresh figs caramelize easily when roasted. Dried figs can be soaked in wine, water or black tea to soften them before using in cakes or puddings. They can be thrown in salads with soft cheeses, nuts and fresh herbs, adding a sherry vinegar dressing to liven it up. Both fresh and dried figs compliment any cheese board and can be used with walnuts to flavour bread. remove the figs from the bowl, keeping the marinade & arrange them in a small baking tray, the cut side facing up. preheat the oven to 180C, sprinkle the figs with the remaining sugar & roast in the oven for about 10-15 minutes or until the sugar has caramelised and the figs softened. place the hot figs onto serving plates and spoon over any leftover syrup from the baking tray, then drizzle over the sauce reduction and sprinkle with thyme leaves.